The original GWR railway footbridge in the image was donated to the Canal Trust by GCC when it was remove from further up the line as part of the construction of the Gloucester South West Bypass. 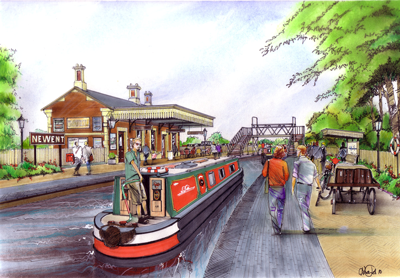 This tourist attraction will be a fantastic asset to the Town of Newent and the Canal crossing Bridge Street will form an impressive entrance to the Town. Nothing of this will happen overnight and the production of detailed designs for all aspects of some 1 mile of Canal restoration will be a focus of the Canal Trust's work over the next couple of years. Some early aspects of this will include new planting and footpaths being established as well interpretation of the site and bringing the existing area of neglected but historically important trees in the station area back into proper management to help maintain both the context of the site and its amenity and conservation potential. Architectural Artist and is to scale.